Recently I launched an iphone application which we mentioned here, now since this was our first application the main concept behind it was more of a learning experience than actually generating large sums of money, and so far it has proven to be just that. Obviously we had done a lot of research before we started but still some things you have to pick up on your own. Not surprisingly most of the knowledge we gained was from blogs, forums and the Apple developer portal, and almost none of the blogs or forums were from the MENA region. Now we managed to get along just fine until we launched the application and found out that mobile advertising or at least serving ads on your application in the MENA region is actually quite tricky! Now when you develop iOS applications the Apple developer portal suggests you serve ads using iAd Network which is Apple’s ads serving platform, they paint a very lovely picture of why you should add their platform over the competition mainly Google’s AdMob and others. Their main selling point is that their ads are more appealing and since they are designed better they generate a greater click through rate. Plus as a developer you get 60% of revenue! The iAd Network pricing scheme works quite differently than the online pricing system, instead of using either CPM OR CPC they actually charge on both CPM AND CPC. So basically on average an advertiser would pay US 10 Cents for an impression and another US$ 2.00 for a click, and as a developer you get 60% of the total revenue. We were thinking that’s pretty decent, if we could enough people to download the application we could earn a fair amount. With that thinking we decided to give it a shot and launch the application with the iAd Network and it was accepted on to the iTunes store on April 5th. Now so far in the past 7 days we have received 241 downloads, not bad I think especially since we didn’t do any kind of extensive advertising other than write a post and send a couple of tweets. Date and revenue: If I need to explain these God help you! 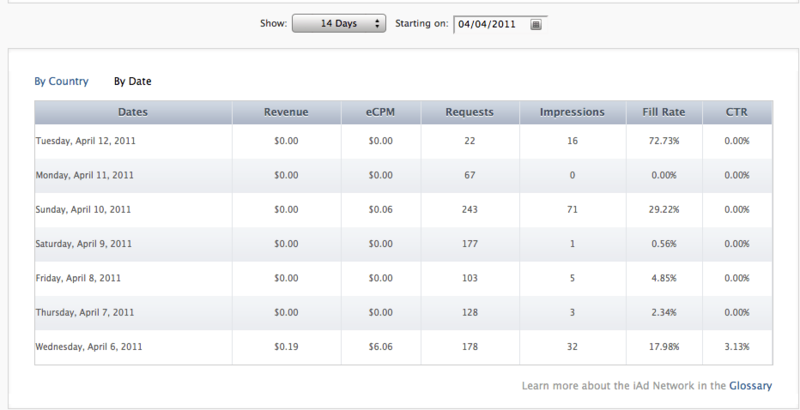 eCPM: Effective revenue per 1000 ads served. Requests: This the number of times the server/application requests an ad to appear. Impressions: Number of times the ad appears on the application. Fill Rate: Ad impressions divided by requests. CTR: Click through rate. Clicks number divided by impression number percentage. The highest country with a fill rate is obviously the USA, then comes UK, and then it tremendously drops down from around 62% to 10%. This means that there aren’t a lot advertisers serving ads on the iAd Network from the MENA region, or they could be but setting other targets to advertise to (I think that is highly unlikely). So for an application that is targeted to a very small market of Arab/Middle Easterners that like to play cards, iAds is clearly not the platform for you! 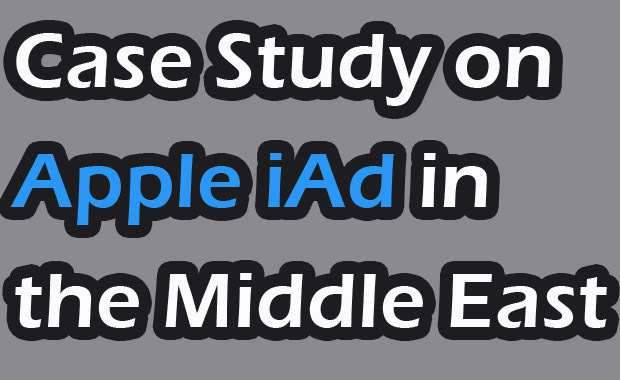 Now the reason I’m posting and publishing this information, is because I personally couldn’t find any information regarding iAds stats in the MENA region. I did however find some information about Admob and we actually posted an article about it here. So I figured I’d share this information to give back to the online/mobile community in the MENA region and hope that it would help. As for us it seems that we are going to switch to the Admob platform, after discussing with some media professionals we are quite confident that it is a better suit for the MENA region and especially for apps targeting MENA consumers. 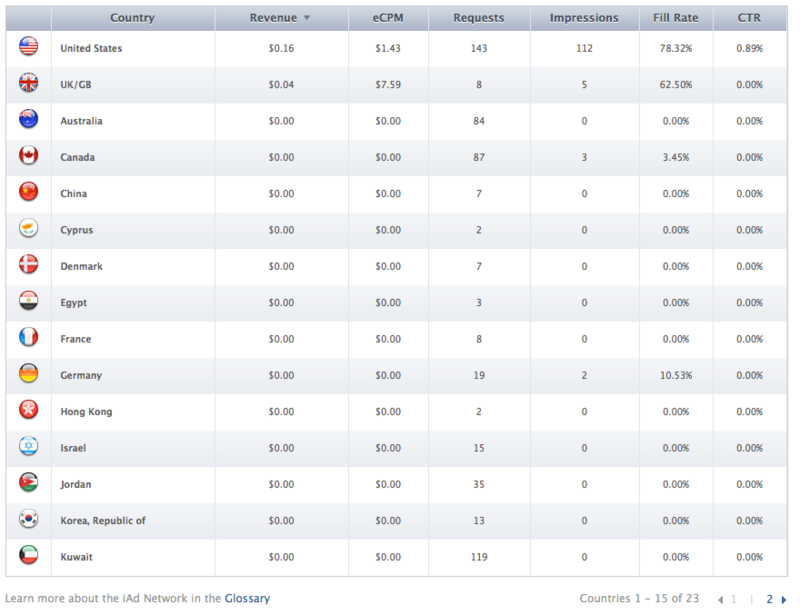 As there are more advertisers from this region serving ads with Admob and Google in general. We will update you on how the performance differs as soon as the changes are live. So please share this article if you’ve found it to be useful, and as always, please let us know if you have any comments, feedback or advice regarding this article. Great, I would be glad to provide any help with the idea/conceptualization if needed. Again, I think you should forget about the region if you are targeting monetizing through Ads and/or purchases in the App store. Good luck! Thanks Mostafa, we are now considering a new app that has more of a universal appeal, while still being relevant to the MENA region. Thanks for sharing, MENA is a really tough market to address. I think you should focus your IOS development efforts on the US market, there is really much more money to be gained if you know your way around. I have been in the same boat before, I currently work for Microsoft Research but I was the previous co-founder of Khayal IE http://www.khayalie.com we were the company that developed Abo 7adeed a few years ago http://www.abo7adeed.com we made some decent revenue from advertising but again the region hasn’t evolved enough technologically to make decent money either in the form of revenue or in the form of a profitable startup exit.